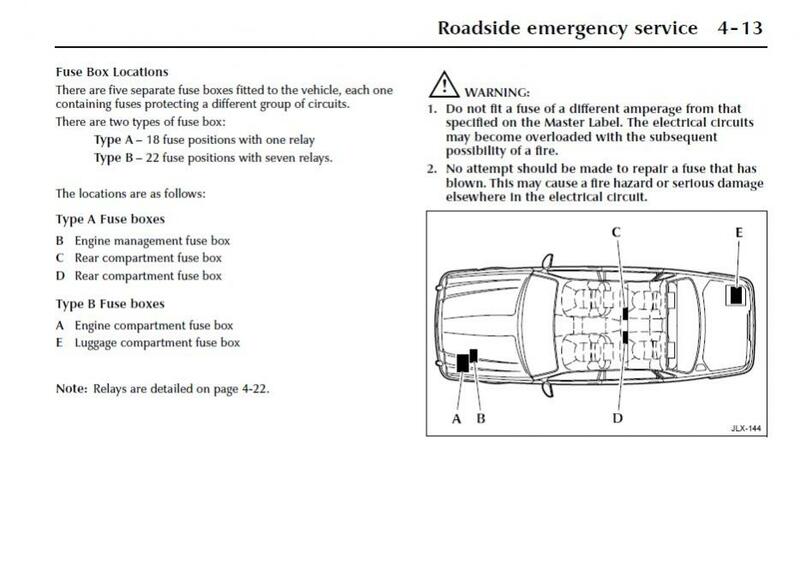 On the fusebox diagram for my 1999 323i convertible it says there is a fuse for the electric roof in the ''luggage compartment'' but for the life of me I can't find it...HEEEELP!!!!!!! I took mine to a convertible top repairman and there is a fuse by the battery in the trunk on the passenger side. Replacing it solved non-functioning top. See if there is one connected to the battery !! 2003 town car trunk wont open with remote or button on door, only key? The luggage compartment lid module receives a voltage signal from the driver door module (DDM) when either the button on the driver door trim panel, the keyless entry keypad, or the transmitter is pressed (twice on the transmitter). Voltage is then supplied to the luggage compartment lid latch, opening it. Using the luggage compartment lid key operates the latch mechanically, resulting in manual-only operation of the lid. There are two switches in the latch. One is monitored by the luggage compartment lid module to sense if the latch is closed. The other switch in the latch is monitored by both modules (LCM and luggage compartment lid module) and is used for disabling the anti-theft system, which is contained within the LCM. The luggage compartment lid module powers the lid motor to move the lid to the full-open position when it senses the latch has been opened. Optical sensors within the lid motor are monitored by the module to determine when to turn off power and which circuits should be powered or grounded to the lid motor. When one of the buttons is depressed with the lid open, the DDM sends a signal to the luggage compartment lid module which powers and grounds the correct circuits to the lid motor and lowers the lid until the latch closes. The module senses the latch closing through the lid latch switch that is monitored. At this time, the module powers the closing motor, slowly pulling the lid to a fully closed position. Two switches within the closing motor are monitored by the module to determine when the closing motor is fully down or up. The module has a vehicle speed output (VSO) (circuit 679) signal that is used to shut down the system if there is a VSO of approximately 5 kph (3 mph) or more. For diagnostics, the module uses the ISO-9141 circuit 70 that is included in the DLC (data link connector). Whenever battery power is lost to the luggage compartment lid module, luggage compartment lid motor or the luggage compartment lid closing motor; the system must be initialized. NOTE: The luggage compartment lid motor is equipped with an optical sensor that the module uses to determine if the lid is closing on foreign materials based on lid speed. If the module detects this occurring, power and ground will be reversed to the lid motor and the lid will open. Verify the customer concern by operating the luggage compartment lid using the four different methods (driver door trim panel button, transmitter button, keyless entry keypad and key) to duplicate the concern. If an obvious cause for an observed or reported concern is found, correct the cause (if possible) before proceeding to the next step. Verify the two grounds (G204, G401) are clean, tight and free from corrosion. Remove and clean to make sure. Monitoring the PIDS in the luggage compartment lid module can verify the DDM is sending the lid-open signal to the lid module. They can also be used to determine if the latch switches, the lid switches and the lid motor sensors are all providing the luggage compartment lid module with the correct and necessary information to operate the system. The VSO input can shut the system down if there is a signal indicating 5 kph (3 mph) or more. If the electrical lid operation is ok, but the key is ineffective, refer to Section 501-14 . CKT 914, CKT 915 or CKT 70 = ALL ECUs NO RESP/NOT EQUIP, refer to Section 418-00 . NO RESP/NOT EQUIP for luggage compartment lid module, Go To Pinpoint Test A . SYSTEM PASSED, retrieve and record the continuous diagnostic trouble codes (DTCs), erase the continuous DTCs, and carry out the self-test diagnostics for the luggage compartment lid module. If the DTCs retrieved are related to the concern, go to the luggage compartment lid module Diagnostic Trouble Code (DTC) Index to continue diagnostics. For lighting control module (LCM) concerns, refer to Section 419-10 for a complete DTC index. This link has all the fuse box locations. The luggage compartment light is often forgotten and causes this problem. If that proves ok you have to discover which circuit is drawing the current by initially removing each fuse in turn and connecting an ammeter across the fusebox terminals. The task of locating and rectifying a current drain is typically either ridiculously simple or complex and time consuming and require lots of dismantling and a good wiring diagram. BEHIND THE INNER COVER AT THE RIGHT OF THE TRUNK.U MUST TAKE OUT THE COVER.. UNDER THIS TRIM U WILL FIND THE MOTOR WITH THE TANK.USE HYDRAULIC OIL THAT U PUT AT THE STEERING RESERVOIR......BEWARE THE SAE OF THE OIL!!!!! How do I change the license plate light? Remove the luggage compartment lock cylinder. Remove the luggage compartment door garnish molding. Release the retainers and remove the license plate lamp assembly. Disconnect the harness electrical connector. Connect the harness electrical connector. Engage the retainers and install the license plate lamp assembly. Install the luggage compartment door garnish molding. Install the luggage compartment lock cylinder. On the Land cruiser there are two fuseboxes. One is beside the battery. The other is just above the drivers right knee. There is a fuse panel under the drivers left knee and an additional one in the engine compartment on the left front fender well along with relays. Look in these to find the sun roof fuse. I'm not a 100% sure which one it is in but this should help. I have a mini one convertible and i dnt no how to put the roof down can anyone help!!!!!! No handbook??? The most important thing is that in the luggage compartment/boot/trunk there is a lever on each side. These operate a storage area for the roof to go into and when you want a larger boot space then these levers raise this area. Try operating the levers first. "If the power system is not operating properly you can still close the roof by hand. 1. Remove protective cover and open luggage compartment lid. 2. Turn screw on hydraulic pump counterclockwise until it stops. 3. Close the luggage compartment lid. 4. Swing the top forward by grabbing it with both hands, lift and push it forward. 5. Lock roof in place. 6. Turn the screw on hydraulic pump clockwise until it stops. Use the same procedure in reverse order to open the power roof manually." On my 1990-XJS, one of the quarter windows did not come up: with the help of the "Electrical Guide", Fig. 29-1/-2 I was able to fix it. In your case, if only one of the 2 windows does not go down, then it can't be the fuse but most likely the culprit is the "down" relay for each of the 2 quarter windows, located under the luggage compartment floor at the driver's side (there are six "Change-over relays" all together). It is unlikely that the ECM is involved because again, it would affect both windows.Yes, like anything else on a Jaguar, it involves some WORK. To help you further, I'd need more details. Have a manual for 1999 BMW 323 Series?